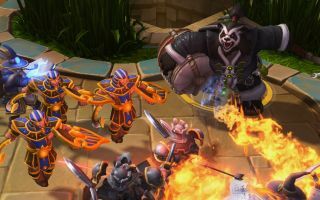 Blizzard's new MOBA-aRTS-lane-pusher-thing is still in closed beta and has some kinks to work out, but I've been enjoying my time with it so far. I've noticed a lot of people have the misconception that the game's simpler presentation and gameplay means it must lack in strategy, which simply isn't true. Watch the video above to see what I think are some of the biggest differences between Heroes and some of the other games in its genre, and why I think removing items and farming doesn't necessarily mean Blizzard has removed depth.